User Review: "Salesforce - is it for your business?" We use Salesforce Lightning within my company predominantly for pipeline management, campaign, and marketing management, calendar keeping, and task recording for efficiency. Our outreach workers each work a specific pipeline of individuals in order to connect with them and have them come into initial appointments. It is being used by two apartments - Outreach and Service team. The main problem is tracking prospect progress, and being a database for our outreach teams. Customizable - so far most issues that we have had have been things that have options to improve and fix. Its a very moldable software. I would recommend it to a person wanting to get really technical about their pipeline management. If you are interested in specializing all types of different consoles and spending a lot of time and energy to customize the software - this is for you. If you do not want to do that, and you would like a software that is pretty easy to work with right out the gate - I would suggest that you use a different product. Salesforce Review: "Quicker and intuitive product to organize your records"
We use Salesforce Lightning to keep all of our accounts accurately represented across the full spectrum of sales, account maintenance, collections, and everything in between. It allows us to quickly access the records we need in a way that cuts through all the extraneous information which isn't needed. We are able to communicate across departments and to attach the documents needed for legal purposes. It seamlessly works with other programs such as Outlook and DocuSign. The number of details and the speed with which one can get to is impressive on both fronts. The organized views quickly break down the records, no matter how large, into easily digestible pieces. The links to other pages inside Salesforce Lightning are easy and quick to use. The details available are precise. The link to Sales Dialer could be more seamless. New users seem to be overwhelmed learning the system's details. It works on all levels of account management. It allows all departments to communicate through the system and to be aware of what each department is doing. In an environment where speed and details are key, Salesforce Lightning is a powerful tool for success. I used to use Salesforce Lightning at my last job to track contract and project revenue for all clients. It was used by the entire company as a means to keep all SLAs and revenue projections in one place. We were able to more accurately track revenue this way, as well as manage one-offs and larger client projects. Confusing Interface - Requires more training. Difficult to easily identify possible duplicate leads in the system. It really depends on the size of your company since there are much simpler, yet powerful CRMs available on the market today. That said, Salesforce integrates with EVERYTHING...so in many cases, it's going to be the best system. User Review: "Salesforce for multiple uses"
Salesforce was used as an information platform to import and export information and data from multiple POS systems and import them into a financial software program. Salesforce was also used as POS for clients and to keep track of our inventory. The ability to track entries and audit information is great. The automated email of the daily company dashboard was very helpful. I highly recommend Salesforce as a CRM or platform, but it's not the best for inventory tracking. Salesforce Review: "Struck by Lightning and Loving It"
Salesforce Lightning is the main UX for Sales Cloud and is used across the organization. It addresses productivity improvement. Keeps you up-to-date on your accounts. There's a great News feature that shows the latest PR or articles about companies in your database. There have been times where I was about to hop on a call only to see the company was recently acquired or recently implemented a company wide-marketing solution. Fantastic intel and save me searching for it. I love the Google address search feature. If I put in the street information, Google will populate the city, state, zip and country. A great time saver when I'm adding new prospects. The Gmail integration is fantastic. It lets me quickly add prospects who contact me via email. It's pretty good at reading signature lines to populate the basic name and contact info. I find the new report builder more powerful when trying to build cross-object reports. Plus I love that you can email the nice new dashboards. On occasion, Lightning will throw out random errors. The errors can usually be fixed by refreshing your browser but the problem is that when you refresh, you lose the work you just entered. It doesn't happen often, but when it does, it's a real pain. Not all of the Classic features are in Lightning. An example is the recycling bin - you need to switch to Classic to access it. Another example is Joined Reports. I wish there were more out of the box page layouts available. It would be nice to have a three-column page layout in some sections or have a drag and drop page builder. The page layout function needs to be revamped. It would be great if it were easier to add custom metrics in reports (for example formulas or baseline numbers) that could be reused without having to build fields. I think that Lightning is suited for most users across all industries. There are just a few kinks that still need to be worked out, but no show stoppers. If you want to limit the time spend administering the system or writing custom code (VF/Apex), Lightning does have many features and components that can be added and modified with clicks not code. Gone are the days when you need a whole team of people to maintain Salesforce. You can get by with 1 person if it's a small to mid-sized org, and 2-4 if it's a large enterprise. Lightning works for small business (one user) and large business. It works great for for-profit and non-profit (there's actually a special non-profit version). It also works great across a variety of industries. I can't think of a situation where it wouldn't be a good fit. Salesforce Review: "SFDC Lightning - great with some wonky bits"
It's being used in the sales org at this time (about 50-60 people). The customer success teams use Salesforce Classic at this time since Lightning was just rolled out. Seems like the plan is to roll out to the entire company at some point. Visually pleasing compared to classic. A bit more intuitive as you can adjust or edit things much easier in Lightning vs Classic. Some of the flows are....weird. Example - if you are deleting a task or event, it takes you back to the previous page you are on and doesn't stay on the current page you are on. If I'm on an account and use the option to delete the tasks (without clicking into it) it will take me to the search screen. The Activities section doesn't show enough detail. it shows the date you called, but not the TIME that you called. In sales, knowing the time is huge. If you have integrations with other software and you go to edit a page, the selected edit box will jump around randomly and you will end up typing in the wrong area. I love it for sales. It's easy to use and the app is powerful when you are on the go. It's got room for improvement but I would be lost without it. Salesforce Lightning is the updated version of Salesforce. It is a great CRM that is used by sales and marketing to manage accounts, leads, and outbound prospecting activity. All of our activity is logged through Salesforce. I find the UI of Lightning both sometimes a little easier and sometimes a little more difficult to use than the previous version. I would say a business would have to have enough revenue to make SFDC make sense. There are free options like Hubspot who offer a free CRM. Some CRMs are more focused on specific types of businesses. One of the biggest strengths of Salesforce is its ability to scale from SMB to enterprise. For a very small business or mom and pop store, I don't think SFDC would be necessary. Review: "Salesforce Lightning from the POV of an enterprise software sales org." We use Salesforce Lightning as our main CRM. It stores all lead/prospect and accounts and current customer information. We use it to track the progression of an individual from an inbound lead to an opportunity to a customer. It is our main depository for sales and marketing related documentation. we also use Salesforce Lightning to generate automated email campaigns. Salesforce Lightning is well suited for either a start-up or a mature company to store and track information on leads and customers. As well as tracking sales progress. I would not recommend Salesforce Lightning to be the main automated email tool for a company. Salesforce Review: "SFDC lightning vs classic - ehh if you can make it work you should switch, but don't stress about it." We continue to try and implement SFDC lightning but many users continue to go back to Classic. It's an updated look but that's about it. Overall it feels like SFDC rolled it out too early and immature without matching feature/functionality with classic - only to try and force adoption later on. I like how, by using it, you have to click less than with classic. They implemented enough pop-up boxes where you can get some quick things done without the page refreshing each time you click like on classic. Reporting - lots of stuff wrong here. Wish they wouldn't force everyone to use it so much. Just make your product something people want to use instead of something they have to use. If you're just starting out with a CRM and currently don't have an SFDC instance, you could probably get away with using Lightning right out of the gate. If you already have an instance that has been customized a lot - then lightning may end up being more of a headache than it's worth. Salesforce Review: "Most User-Friendly CRM to Use"
Our organization works with Salesforce as the main product. We customize it for our customers and support them afterwords. 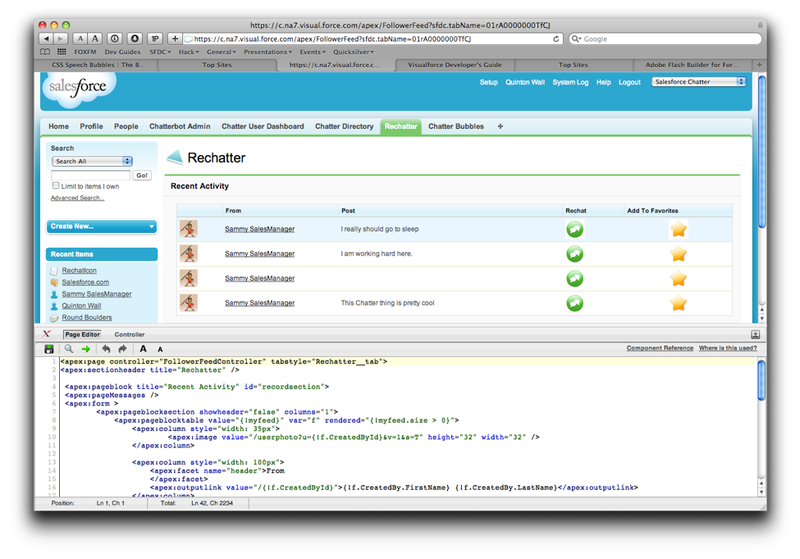 I use Salesforce as administrator setting up to prepare demos of our mobile product that synchronizes with Salesforce. Mostly we use Salesforce to customize organization for usage of sales representatives and their managers. It is best suited for large organizations to set some automative steps - workflow rules, auto-response, validation rules, and others. Salesforce is mostly used to manage sales processes, leads, and opportunities. Review: "Salesforce Lightning good for customization and scale, but not end-user friendly"
Context: we are an education company, but I've also used Salesforce Lightning in a traditional sales org. We have student-focused teams like admissions and student advisors. We also have account managers who build and sustain relationships with our partners using Salesforce. Admissions: for tracking leads, recording all conversation information/notes, and ensuring their applications are complete. Student advisors: once students are enrolled, they use the Contact and Opportunities objects to track student success in their programs, also recording all conversation information/notes. Account management: our account managers track holistic student success data to track account health. Management/leadership: we use Salesforce Lightning to know how we're performing as a company. Our students' success is directly our success. Track customers/students via an individual object: via lead or contact, but not by tracking them via both. 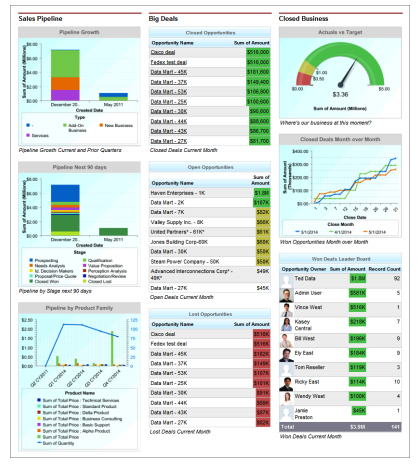 Compare the performance of your team members via reports and dashboards. Limit permissions of people or groups of people. It’s hard to run reports or create working “views” for customer-focused teams that include both Leads and Contacts in the same report. Some fields do not map from Lead to Contact object. When a customer/student transitions from application to acceptance, some dropdown and fill-in fields completely disappear from the student’s page in Salesforce. Every version of Salesforce I’ve used has this problem. Salesforce overall is clunky and confusing for the average user. We require thorough Salesforce training for new hires on all teams because it’s not user-friendly or obvious what to click on to achieve a specific task. Groups that need to integrate their CRM with other partners: many of our partners use Salesforce! Groups with huge customer populations now, or expected in the future. Groups that have resources for custom Salesforce development, like an in-house Salesforce Developer role. If you expect your company will have a limited number of customers. If you set up Salesforce to use ONLY Leads or only Contacts, not both. What happens if you have a customers upsell or re-purchase? How do you handle losing data when converting a Lead to a Contact? If you don't have good answers for these in advance, you'll want to use only Leads or only Contacts to track each customer/student. User Review: "An updated UX from Salesforce classic"
Salesforce Lightning is being used as my company's CRM platform. We utilize it to track the buyer's journey, understand target accounts and prospects, and then understand where clients are in the use of our products. Salesforce is mostly used by our sales team, as well as the account team. We have other systems integrated into Salesforce, such as Pardot, service cloud, and financial force, which means that almost the entire company touches the system in one capacity or another. The Salesforce Lightning user experience is definitely an upgrade from classic. It makes it much easier to see multiple accounts, leads, etc. With many different integration capabilities, Salesforce has a lot of potential to be a single platform for an entire organization. The migration between classic and Lightning is not the simplest, and has a lot of possibilities to cause confusion for those who are used to the classic version. Salesforce provides a lot of customization options, which in theory is great, but can also lead to a messy organization that can quickly become very expensive to try to maintain. The support available for Salesforce leaves much to be desired. Although they have many educational resources, because every instance of SalesForce is different, it would be better to have someone who you can speak with and can actually help troubleshoot. Salesforce Lightning, similar to SalesForce classic, is well suited for companies selling a product and looking to manage their customers. It can be a scalable system for managing the sales cycle. It's probably less appropriate if you are looking for something just for a specific team outside of sales, there are likely better tools out there. That said, one value of Salesforce is how many integration partners they have and additional services they offer to meet the needs of different team functions. We use Salesforce across the whole organization. We use this tool to manage customers and their financial needs. We did lots of integrations with other tools to keep SFDC as our primary source. Salesforce is well suited for: Community management, Articles, and partner portals. User Review: "Salesforce but with a UI facelift"
It really depends on the individual using it. I've attempted to use Salesforce Lighting a few times, but I prefer the classic version to the Lighting version. Some departments within our organization have switched over, but the majority have remained on the classic version. I'll admit, it's difficult switching after using the classic version for over 5 years. A simplified, clean user interface. For me, the setup is more organized than before. The assistance feature on the home page is a nice touch. Lightning doesn't seem a customizable as the classic version. Overall, the biggest change is simply the UI. Other than that, it doesn't motivate you to switch over if you prefer the classic version. Not all integrations with Salesforce are Lightning-ready. It doesn't differentiate itself much from the classic version other than the UI. Because of that, I've been hesitant to switch as I'm already comfortable using the classic version and it doesn't motivate me to make the jump. It's possible that there are features that I'm missing out on that perhaps Salesforce could do a better job of educating me on. We use Salesforce for our resources and referral program. We run a contact center to provide health information and resources for the state. People can contact us through phone, text and live chat. Our agents provide them the resources and refer them to appropriate programs. SF provides the CRM solution for this program. Very helpful to have the lightning layout to create quick data intake while agents are on the phone. Nice drag and drop features. Lightning pop-up form's size is fixed and is not flexible enough. When you update the report that links to a chart, the chart doesn't automatically update accordingly. Not all apps work in Lightning - for example, Salesforce's own LiveMessage only works in classic. It works very nicely for call center chatting. Call and data intake flow seems to follow a very mature workflow, which SF solidly has. We recently added LiveMessage (a product from Salesforce to allow texting). Agents can log into Salesforce Lightning with LiveMessage, but in order to send and receive messages, agents have to switch to Classic. It's not an ideal workflow at all, considering LiveMessage is a Salesforce product as well. Salesforce Review: "A very good way to manage the sales process"
We use Salesforce.com across our entire business development and sales operations to keep track of our customers and prospects. Easy to manage the sales funnel and get helpful insights from their data visualization and collection. Navigating the newer vs the older interface can be a bit of a challenge. There are a lot of great features that are very difficult to find in the new layout. Managing client information is incredibly easy. They understand the sales process and have built that into their design so that it takes the headache out of keeping track of the sales cycle. Salesforce Review: "A new look on a classic tool"
Salesforce Lightning is being used globally, across the whole Rapid7 organization, to provide a receptacle for legacy NetSuite data to make outreach efforts and customer tracking even more visible across all facets of the organization. It saves us time by allowing us to track our efforts, set tasks, send out quotes, make sure there is no double outreach, and increase our ability to be agile in our sales/customer retention/support roles. Salesforce Lightning is best suited for Sales people, Customer Service, Support, and Managers to track employee production. Salesforce Lightning is less appropriate for scenarios where you are attempting to filter through mass amounts of data quickly. They need to increase application speeds to limit frustration and clicks where it is not necessary. Salesforce Review: "Using Lightning for over a year... meh." Salesforce Lightning is being used by my company to track customers and prospects. It's mostly used to track them in the sales process. Sales department uses Salesforce the most compared to other departments, though support, engineers, and onboarding teams all use it on more of a limited level. Some buttons on Classic have not ported into Lightning so my team has to switch between Classic and Lightning to accomplish daily tasks. Well suited if you are a big user of the dashboards or reports tabs in classic. It is overall a more cosmetically pleasing experience and some areas of normal frustration have been cleaned up while others are not ready yet. Though, it seems to be pushing out a beta experience because not everything works like it should, and we often have to switch between Salesforce Classic and Lightning to get normal daily tasks completed. Salesforce Review: "Critical sales enablement tool"
Salesforce Lightning is critical to our organization and is used by our entire sales team as well as our VP of Sales and consulting services team to manage our end-to-end sales process. Our sales team uses it to manage leads, opportunities, and clients. It allows us to log notes and communications, schedule tasks (i.e. follow up calls), events (i.e. product demos, proposal review calls), and reminders. We also use it to forecast our quarterly sales revenue, which is critical to the business. And it gives us all visibility into which companies are already in conversations with other sales reps in our organization, and which companies might be appropriate to reengage. The platform makes it easy to tracks communications, saving our reps a ton of time with it's Outlook integration for automatic email logging. It's also easy to build custom reports to keep track of individual performance benchmarks for planning. I do miss some of the functionality from Salesforce Classic, like the ability to build a custom home page by user, which is not supported in Lightning. I also have not been able to figure out how to view my "recently viewed" items without seeing what's been recently viewed by all users, although there may be a way I'm not aware of. I think any sales team with young, computer saavy sales reps, or reps that haven't used a CRM at all before, should opt for Lightning as they seem to be phasing out Classic and adding more and more functionality to Lightning. But if your team has been used to Classic and is resistant to change it might not be worth switching until there's no longer a choice as it could interrupt productivity. It does take a little time to get used to. Review: "Salesforce.com...The best CRM for ALL types of Sales People!" We use Salesforce daily to connect with potential new customers and keep track of our interaction with both current customers as well as potential buyers. The notes that we keep are invaluable because they make our interactions both meaningful and productive. Keeps track of the number of times you have reached out to a potential customer. Allows you to follow the progress of an opportunity. Gives us the ability to organize the teams that are looking into our solution. We have problems with Outreach and Salesforce integrating. I don't know how to solve this, but there is too much room for human error. I think SFDC is perfect for both prospecting for new customers and keeping track of your current customers. I have used homegrown CRM tools and a few other tools in the past and Salesforce.com is above and beyond the best solution that I have ever used. Very simple customer interface and allows you to have all of your information in one view. User Review: "Minute by Minute User of Salesforce!" Our entire team uses Salesforce daily... not even daily, but minute-by-minute. All of our operations from recruiting, marketing, sales to customer success uses Salesforce to ensure our process are as streamlined as possible and nothing falls through the cracks. Some of the integrations with Salesforce we use are Enthusem for automated direct mail, TaskRay for project management, Outreach for sales, Ebsta, HubSpot and ZoomInfo for marketing. These integrations make our transition from recruiting to marketing to sales to success seamless! They don't try to be everything, they just let everything integrate. Lightning is a great experience for our users. Workflow rules allow us to automate process. Integrations allow our departments to work seamlessly. Catching up Lightning to have all the same functionality as classic. You have to bounce back and forth a lot. Sometimes it's hard to get to the data you're looking for. Allow for more data on dashboards. Best for tracking leads for sales teams. Salesforce Review: "The CRM for Professional Sales Teams"
Our sales team uses Salesforce Lightning to manage leads, contacts, opportunities, and sales activities for our clients. It enables our sales team to make better decisions to generate more opportunities and close more business in less time. Salesforce Lightning is well suited for professional sales forces, especially those using others sales tools as part of their technology stack. It is less appropriate for less developed sales forces or those not requiring third-party integrations. Review: "Salesforce Lightning Strikes a Great Balance"
We use Salesforce in the Office of Advancement (broadly), and I specifically use it with the Office of Alumni and Family Engagement at CalArts in order to better relate to, serve, fundraise, and friendraise among the greater California Institute of the Arts community. We also enjoy its functionality to pair with and sync with other platforms we use for phonathon, communication, and marketing. Customizable snapshots, reports, and home screens. Linking multiple systems is great but inconsistent across platforms. Application building requires more work than we anticipated, not as simple a solution as we hoped. Miss some features of other earlier versions. Salesforce Lightning is well suited in scenarios in which we are concerned with task management, optimizing workflows, and bulk actions. Pipelining and storage of information are excellent, and dashboard customization is really wonderful compared to earlier iterations of Salesforce. Automation of e-mails and reports is great as well, as it enables us to better share and template strategies throughout our department. User Review: "Sales improvement with Salesforce"
The software is being used by my team as a research tool for companies involved with nature conservation and production proposals; in which they need to plan a balance between both areas. The software is being used for prepared company scenarios for production and how they can sell their products, contacts and invoices, including the flow chart to do so and the recommendation of the implementation of a similar software. I did all this work to look for the money to invest in nature by the companies, and that needs to be balanced somehow. The software is really powerful in every area, and makes me understand the reason behind sales and how I could be in touch with my costumers, even if I'm a planner for territory and environment. All you need to do is have your flow chart very clear and process the work under your guidelines, and it is the most helpful software you can use for improve your sales, no matter what area you work with. With the right choice of products and software settings, the software will suit you nicely. Salesforce Review: "Best CRM software available on the market"
We have embraced Salesforce CRM as our best business automation solution, marketing automation software, team collaboration and during this period we have seen a tremendous increase in our sales compared to previously when we had not started using Salesforce. It is customizable and supports the various departments in our organizations from a central point. Salesforce is suitable for medium and large size organizations who would like to manage their customers from one central point, manage marketing campaigns, manage leads and automate various business processes. 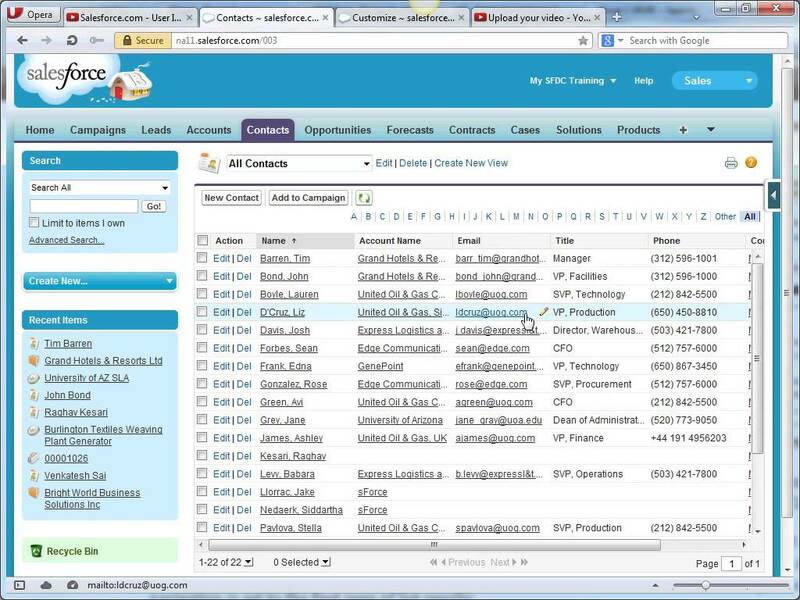 Salesforce is a web-based CRM application that enables users to forecast revenues and track leads. It is a leading sales, service, and marketing app. Salesforce.com's Sales (CRM), Service, Platform and Marketing applications are designed to help companies connect with customers, partners, and employees in entirely new ways. According to the vendor, on average, reps using Salesforce see: a +29% increase in sales from greater visibility, +34% increase in sales productivity, and +42% increase in forecast accuracy. Salesforce CRM - More than just a contacts database, Salesforce CRM is your centralized repository of customer information in the cloud.Salesforce Dashboards - Advanced reporting for Sales Executives, Sales Managers, or Service Managers allows you to keep a pulse on customer acquisition and satisfaction.Force.com Platform - More than a CRM or Service Application, Salesforce is a full cloud-based development environment supported by a rich ecosystem of integrated third-party application providers.